Happy Tuesday Friends!! Today I would like to share with you my third Really Reasonable Ribbon blog post. I'm in Christmas mode. 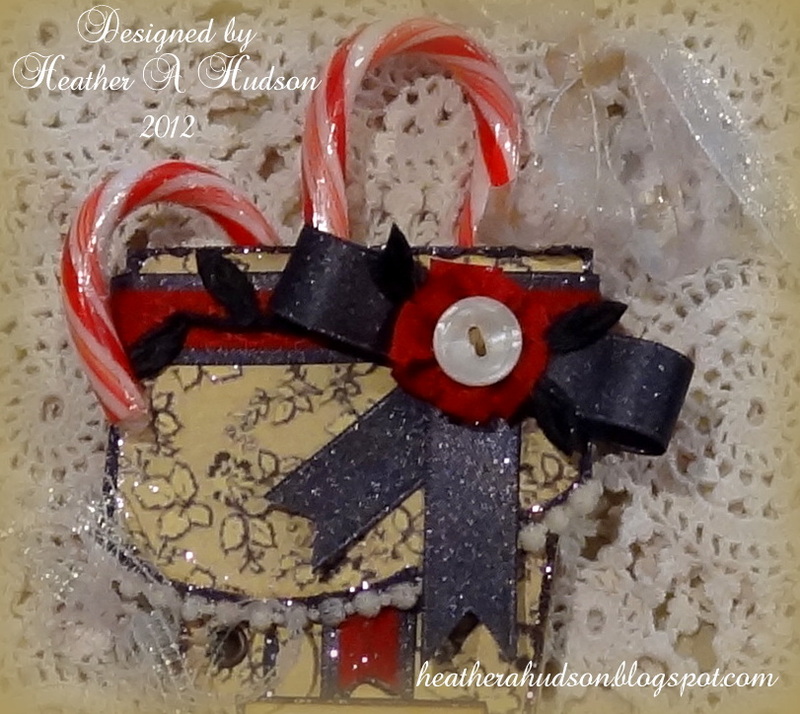 So today's creation is a Vintage Chic Christmas Ornament. (I know you are thinking...she is always doing ornaments....lol). I used some fabulous ribbon and trims from RRR. Red leaves, ivory pom poms, peppermint baker's twine and aqua organza ribbon, really add to my retro Vintage Christmas ornament. I used a two freebie Angel images from Gecko Galz. You can find the original images on some of the other Gecko Galz DT blogs. Leanne gave them to us for free to give to you, yesterday during our Cyber Monday sale. I did some editing to it, then added it to a different background and shrunk it so it would fit with in my spellbinder die. 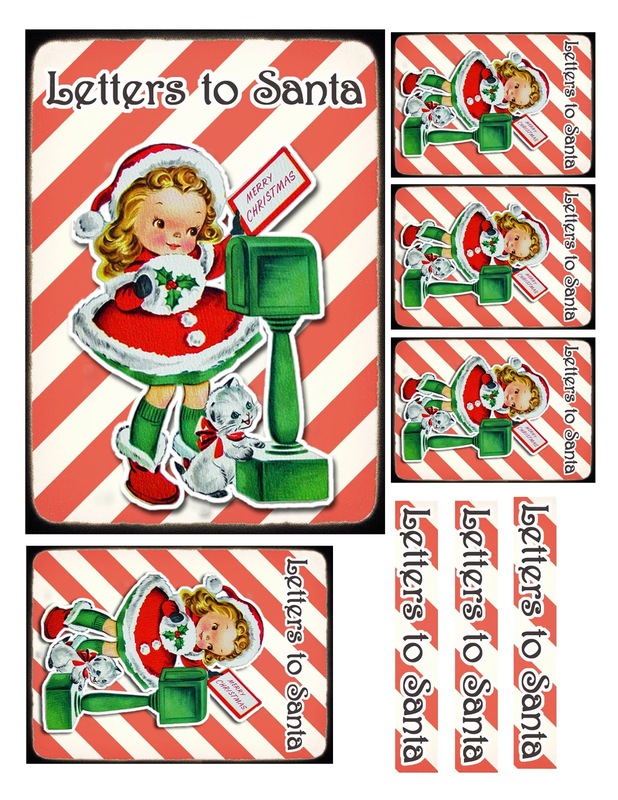 I used some candi foam pads to add a little dimension to the "letters to Santa" piece. Here are a couple close ups. I used ivory card stock for my piece that I used with my spellbinder die. Inked my edges with Ranger's Vintage Photo Distress Ink. I used Art Glitter Glue to add glue to my piece and I applied both red and crystal glitters (refer to photos for placement). This is a super easy ornament that you can make. Hope you have a great day! Thank you for visiting!! Here is the collage sheet that I created, a lot of work goes into these, I get rid of backgrounds, add things, there are many layers to my work. Collage sheets are more work than they appear. I normally don't tell you all the deets on the changes etc, because it would bore you...LOL. Feel free to watch some of my youtube videos on working with GIMP. You will see what all you can do to alter images, and the time that it takes. I just wanted to let you know that Leanne has some wonderful Cyber Monday deals for you at Gecko Galz. Buy one Get one: all regular priced items, when you buy one you get one of equal or lesser value for free. $1 Collage sets: selected collage sets will be only $1.00!! Spend $50.00: and get a Free Gift Pack: this will be an exclusive gift pack which features a paper pack and collage set!! $5.00 Gift Card: when you purchase a gift certificate of $25 or more. Give a gift, get a gift is what I say....LOL. 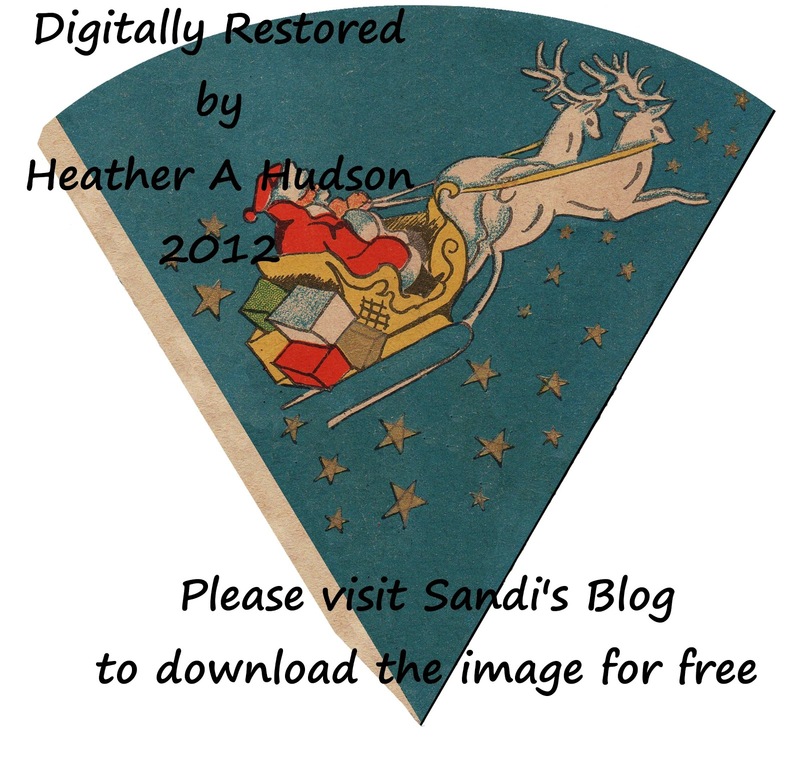 Leanne has given this fabulous Christmas image for me to share with you below. Just so you know, some of the other DT members have free images on their blogs too, so you may want to pop on over to their blog and get their images too. Isn't this just the cutest image ever?? 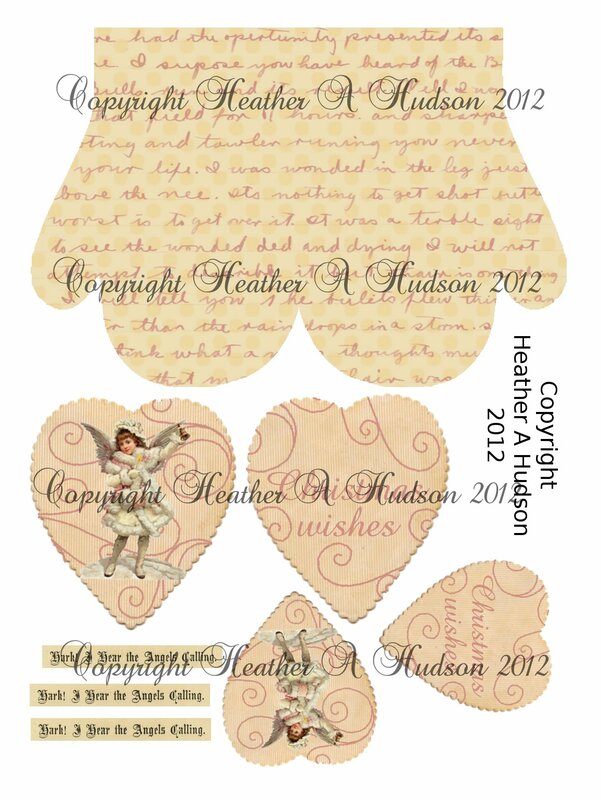 To help you remember that Heather sent you, (lol) I have created this little collage sheet below using the image. I have it in the original size, and smaller. Just click on the image, then right click and choose "save as"
Have fun Shopping at Gecko Galz!! It is week 39 at Sugar Creek Hollow and this week our challenge is for you to create a Vintage Christmas Creation in the Vintage or Shabby chic style. Jo Ann. It has been sitting in my basement for a couple years waiting to be "beautified" LOL. You can see how the original ivory color has yellowed and how they had two doors for the 24th, instead of one for the 4th and 24th. Obviously, I didn't realized this when I purchased it (I bought it for $64.00)...LOL. I had sold a few that I had painted (different style calendar, not as pretty) the year before for $224.00 on ebay. I thought I would give it another try, boxed them up and forgot about it till this year...LOL. I gave it a beauty lift, by painting it pink. I have it for sale in my ETSY. I have two actually, but the other one I will be hand painted all the doors, similar to the ones I did before. This one is more Romantic and Vintage looking. I added lots of fabby trim and ribbons and other embellishments to give it a great shabby vintage feel. Really Reasonable ribbon. I got the hand dyed seam binding from Debbie at the Shabby Tea Room. I also used a lot of buttons and mica flakes. I used a spellbinder die to cut out all my little pieces, then stamped on the numbers, which I then embossed with olde gold embossing powder. Here is a look at the top. I did use a lot of my favorite embellies, and beads from my stash. I think it has a great Vintage Shabby Chic feel. Here is a photo with some of the doors open. My other DT challenges you may be interested in playing in. Really Reasonable Ribbon: Anything but a card & Ribbon. Hello Friends!! Happy Sunday!! Today is my second time posting at Really Reasonable Ribbon. I have another fabulous Christmas ornament to help inspire you to create some holiday ornaments of your own! 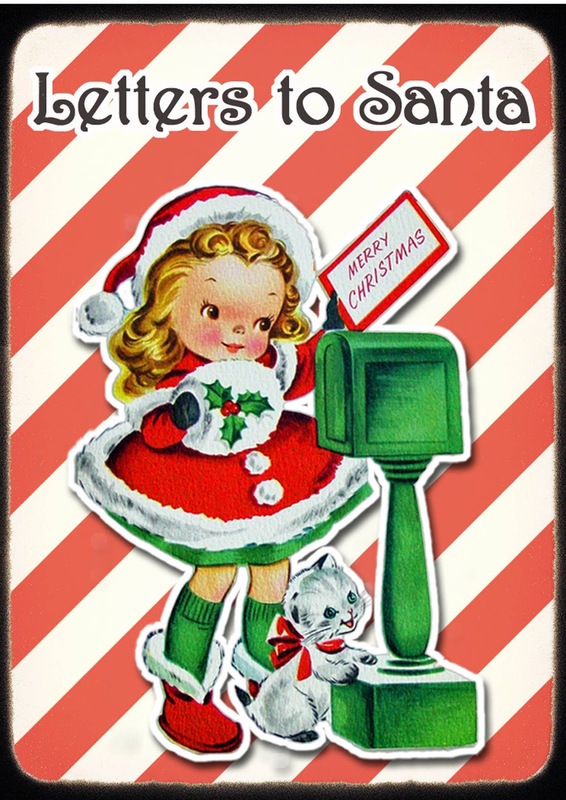 I have created a "Retro Vintage Christmas Cone Ornament." Here is a look at the image before I fixed it up. Here it is fixed up :0) I just love GIMP. Feel free to see my tutorial on how to use GIMP here. 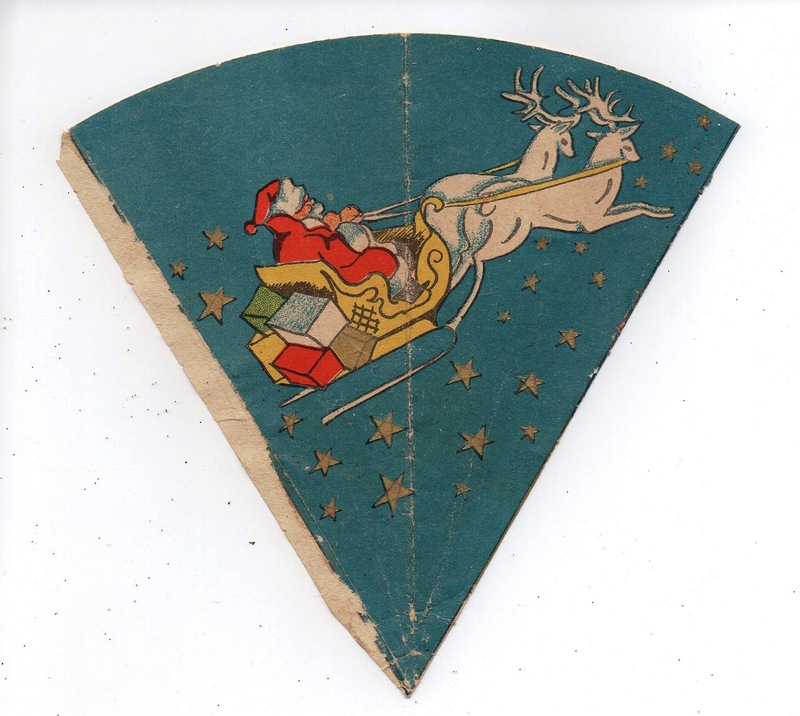 Here are some more photos of my Christmas Cone below. I used some Mica flakes and Glitter to add some sparkle through out the cone. I also used Utee to make the stars pop. Here are some additional photos of the rest of the cone. I hope that this inspires you to create something fun and festive!! Anything but a card and ribbon!! I will be sharing with Make it Monday Have a great day!! Thank you for visiting!! Week 38 Sugar Creek Hollow "Use Kraft"
It is week 38 at Sugar Creek Hollow and we would like to see you use "Kraft Card Stock," in your Vintage or Shabby chic style creations this week. I started out with a wood bell shape Christmas ornament, which I painted one side pink, and covered the other side with kraft card stock. 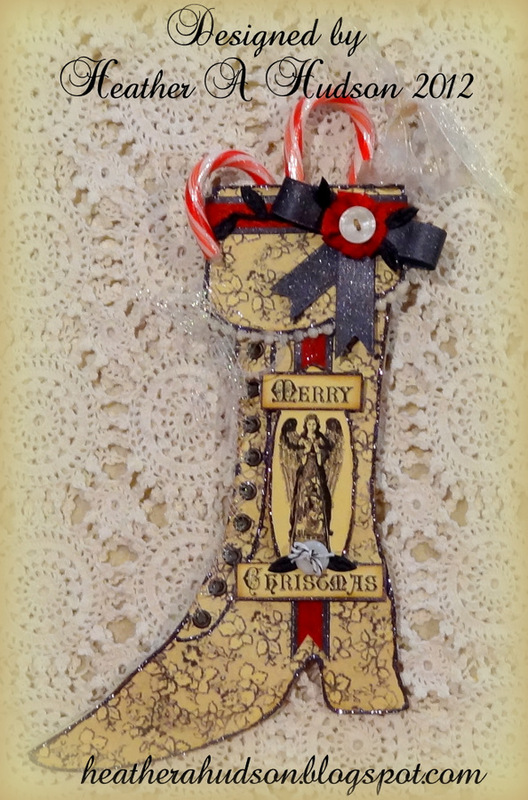 Here is a look at my finished Vintage Chic Ornament. I used some Ivory Jute ribbon, brown sugar baker's twine, penelope lace from Really reasonable ribbon. Blue bird image is one I altered from the Graphic Fairy. I applied the card stock to the 41/2" ornament with glue. Then I sanded the edges, and inked it with Ranger's Vintage photo. Added all my embellies, then added some mica flakes to give it a little sparkle. I really wanted it to be a more "Natural or Nature" looking ornie. Here is a look at the back. In all honesty, I painted the ornaments pink first, and was going to paint them in the shabby chic style and then list them on ebay, but then changed my mind and decided to add the kraft paper. I am happy with how it turned out. Here you can see one of the tiny kraft card stock flowers I punched and added a champagne pearl center. That way you can see what you can win!! Here is a photo of it below!! So rich and elegant don't you think? You can take a peek of the video below to see this month's assortment!! 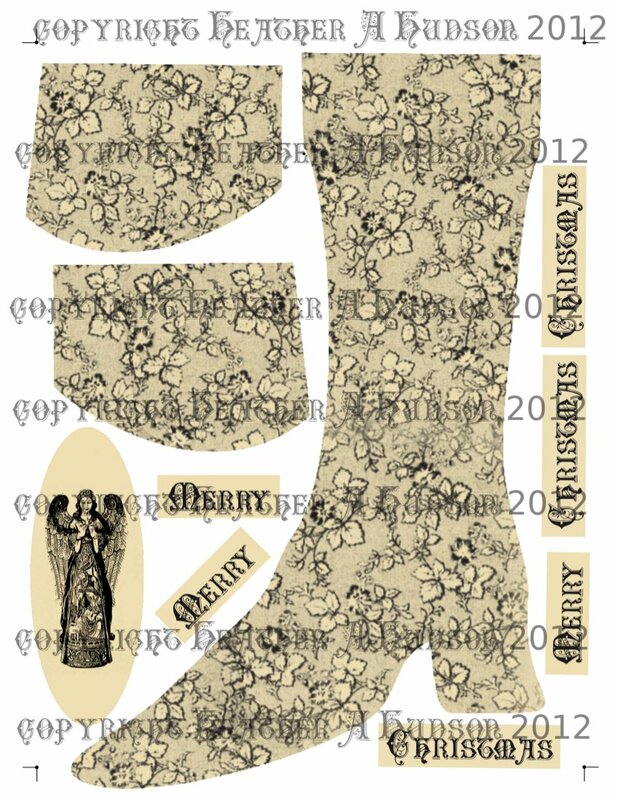 Here is my "Vintage Ladies Victorian Boot." I created my own Vintage Boot Template (in inskcape), and digital paper (in GIMP). I love how sparkly the ribbons and glitter are!! I inked all my edges with Ranger's Vintage photo distress ink. Used my crop o dile to punch all the wholes, and set the grommets. I used Art glitter glue with an adapter, to create the thin outline around my boot. Then I applied a Martha Stewart glitter (from a variety pack). The vintage buttons are from my stash. Angelica Collection at Gecko Galz. Let's take a peek at the back. I used the same ribbons and trims, just did them a little differently. You can just make out the diamond pattern to the red ribbon. It has great texture! I used the candi foam dots between all my layers. There are two boots, and two boot caps. The ones between the boots are what created the pocket so that the candy canes could slide in. The ones between the boot and the caps, are what allowed the pom pom trim to hang so nicely. I did place grommets on both sides of the boot (18 total). I love how they look!! Again, I created my own template and digital paper. The images are from the Graphic Fairy. I used the Black Diamond ribbon from this month's RRR assortment, white curly trim, Penelope lace, Ivory Jute ribbon and Moss green may art leaves to add to the vintage feel of my card. Here is a look with out the gift card. 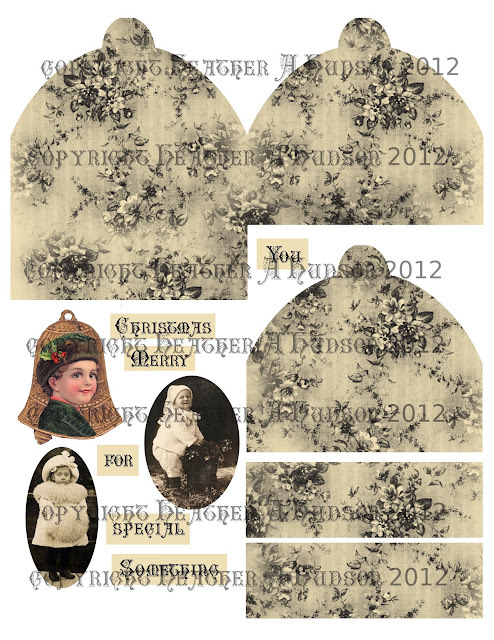 The collage sheets will be available in my etsy. Just choose to follow me by email (upper left) and leave a comment below (already a follower by email, then let me know in your comment below). I will do a Random Draw, and Three followers/comments will win my collage sheets. I will post the winners in my RRR Blog post on November 18th. You will have one week to claim your collage sheets!! Time to hop on over to Jeanne's blog, see what she has created, and leave her a little love. Then you will want to Visit Bonnie's blog...she owns RRR!! I hope you are enjoying the hop!! It is week 37 at Sugar Creek Hollow and our theme this week is "One for the Guys," We would like for you to create a masculine card in the Vintage or Shabby chic style this week. I found a great image from the Gecko Galz Man O Man collection. I used an ivory card as my base, and I inked all my edges with Ranger's Vintage Photo. I topped the card base with the ivory and black patterned Graphic 45. and used a spellbinders die with some more Graphic 45 (offset, with the edges cut off to match sides of card). I printed out two of the image, and cut out only the shirt of the second one, so that I could apply pop dots on it, and mount it a top the shirt part of the original image. I then mounted the piece onto some black cardstock and then placed it on my card. I used brown sugar baker's twine, ivory jute trim, red May Arts leaves, newsprint candi, and foam dots from Really Reasonable Ribbon above, as well as some brown and white striped ribbon that I used to frame the card with. The red ribbon and black diamond ribbon are from the November Club assortment. I can't wait to see what kind of masculine cards you come up with!! Be sure to come and link up at Sugar Creek Hollow!! Really Reasonable Ribbon Blog Candy!! Here is a picture of it below!! So...pop on over to the RRR blog (follow the link above) for your chance to win!! All you need to know is there!! You will have until Friday December 7th, at 11:59 Est time to enter!! Winner will be announced on the RRR blog on Saturday December 8th. Happy Wednesday Friends!! I am so excited to be joining the talented Design Team at Really Reasonable Ribbon! Today is my first Post on the RRR Blog. For my first project I would like to share with you this fabulously trimmed Vintage Snowflake Ornament! I used all kinds of lovely trims and ribbons from RRR. These are some of my favorites, so you will see them on many of my creations!! Moss green leaves, mini yellow pom poms, Sheer Iridescent champagne ribbon, Peppermint baker's twine, and curly sparkling white trim really give my ornament that Vintage look! Here are some close ups. I created the ornament using a collage sheet I designed for Gecko Galz, you can purchase it for $2.50 in my Etsy store (collage sheet has two snowflake ornaments, front and back). Below you will see where I trimmed the leaves to give them more of a "holly leaf" appearance. I also used the Candi Fix Foam Pads to add some dimension to my ornament. How about a look at the back? Those of you who know me, know that I have a little disorder that compels me to have the backs of my creations look good too. I just love how the Sparkling trim and Ranger's Barn door stickles really adds to the vintage Christmas look! When this is on one of my trees, it will catch and reflect the light beautifully!! 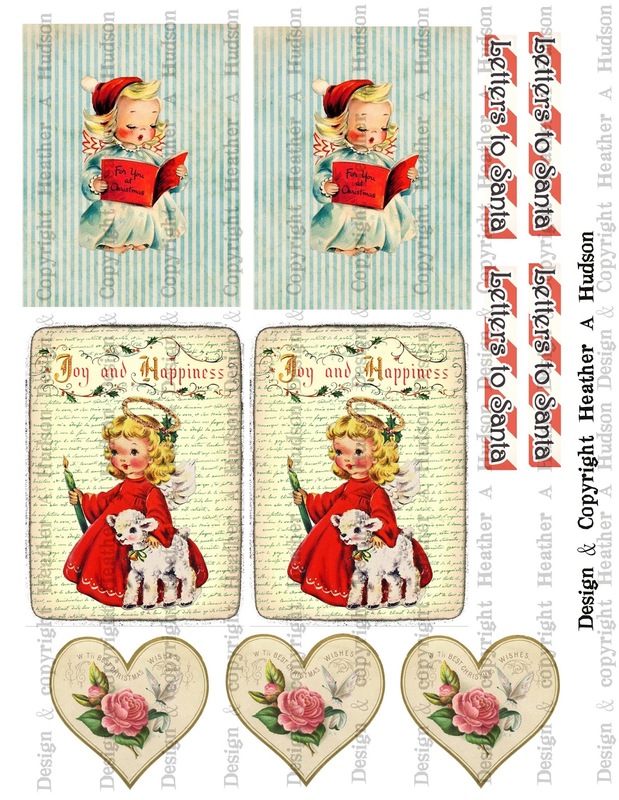 It is week 36 at Sugar Creek Hollow and our theme this week is "Cream plus Two Colors," We would like to see you use Cream and two other colors in your Vintage or Shabby chic creations this week! I used my same mitten template that I created in Inkscape that I used for my Vintage Christmas Mitten Pocket. I used lots of sweet embellishments on my mitten :0). I have some cream mulberry roses & champagne flat back pearls from my stash. I used some brown leaves, Penelope lace, pink seam binding, cotton candy baker's twine and champagne sheer ribbon as well as newsprint candis (and foam pads) from Really Reasonable Ribbon. The sweet little girl image is from Karen the Graphics Fairy. I used GIMP to create the backgrounds for my mitten and the heart piece that the Angel is on. The "Hark! I hear the Angels Calling" from a Graphics Fairy image too. I inked all my edges in Ranger's Vintage Photo Distress ink. Here is a close up of the bottom. I found the pink rosette trim at JoAnns. Here is a close up of the top of my mitten pocket with a piece of vintage trim tucked into it. Cream + Two Colors Challenge at Sugar Creek Hollow. You can purchase the collage sheet below for $4 in my Etsy. Divas by Design: Feeling Festive! !